I would really appreciate it if you would fix the deal-breaking meeting organizer bug. As it stands, I cannot use this product and I really wish that I could. 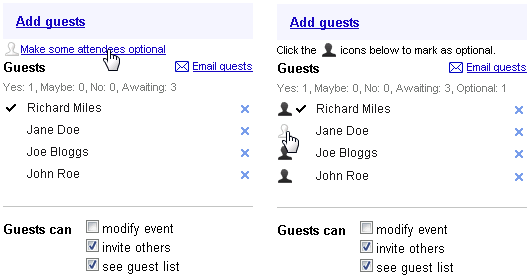 I would love for this feature to be included in Google Apps. As of right now, it does not appear to be available. Will this be rolling out to all users of Google Apps soon? I love Google Calendar after a month of using it. 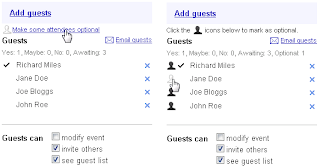 So, this new feature ("Optional attendees”) as a great added value where I can interact with the selected attendees. Now I can shift to "Optional attendees” instead of using facebook. How do i set up for Optional Attendee?